Hartford is nicknamed the insurance capital of the world because of the many insurance-company headquarters it houses. 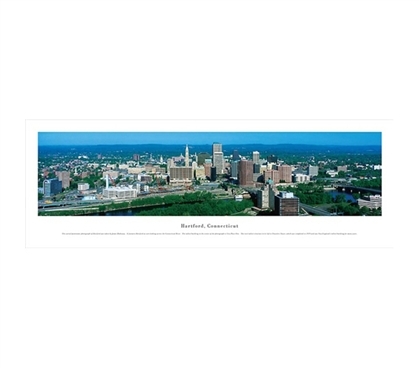 It also offers a scenic skyline, which is captured here in this Hartford, Connecticut - Panorama. Panoramas displayed on your dorm walls can bring cool college wall decor that's a step above your everyday college posters. Wall decor for college is needed if you want your dorm room to look awesome. Actually, you'll need wall decor items just to make your dorm room look decent. These panoramas, however, can make your college decor look way beyond decent! This aerial panoramic photograph of Hartford was taken by James Blakeway. 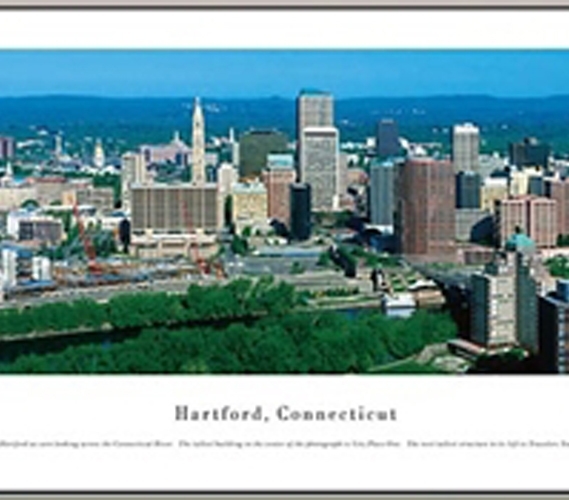 It features Hartford as seen looking across the Connecticut River. The tallest building in the center of the photograph is City Place One. The next tallest structure to its left is Travelers Tower, which was completed in 1919 and was New England’s tallest building for many years. The gold-domed Connecticut State Capitol is visible left of Travelers Tower. The bridge to the far right is Bulkeley Bridge, which was built in 1908. Mark Twain, the prolific American author, resided in Hartford from 1871 to 1891. During this very creative time, he wrote classics such as Life on The Mississippi and Adventures of Huckleberry Finn.